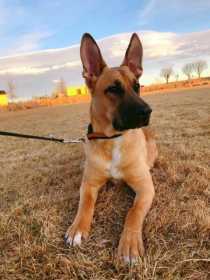 Lost German Shepherd and Labrado mix! I thought he jumped out of the fence. Last seen place is in my friend’s house of 1331 E 20th St, Greeley, CO 80631. His name is Mochi and he is 8 months old. He is 75 pounds and is wearing a blue and orange leather collar. He is very friendly and runs very fast. He has been lost since this afternoon (3/19) at 4:30pm. Please call us if you see him. He means a lot for me, please! !